Do you remember Skull Coast? It might have been a few years. Maybe since about 2011 since those beers were available in South Carolina. Like the pirate and skull from which its logo comes, so is their tale one of intrigue, mystery, and some choppy seas. First, a history. Skull Coast was incorporated (legally, it’s an LLC) in South Carolina in 2009. Back then, it was known as the Skull Coast Ale Company, LLC, and was based in the Rock Hill/Fort Mill area. Because the company did not have a great deal of investment capital, it became what is called a contract brewery. If you’re not familiar with the term, it essentially means that it is a brewery with no physical location that contracts with established breweries to brew their beers. Skull Coast partnered with RJ Rockers in Spartanburg to do this. The result was very respected beers like Gallows Point Dead Man Porter, Sea Witch Watermelon Wheat Ale, Scallywag Extra Pale Ale, and Maelstrom IPA. While the beers were in fairly limited distribution, they could usually be found in either the Upstate or Columbia markets. They were even available at Carolina Panthers games in Charlotte for awhile. At that time, South Carolina did not have the Pint Law, thereby limiting what breweries could serve on site to patrons. Skull Coast saw an opportunity and left contract brewing with RJ Rockers to go to North Carolina, with its more favorable laws. The company Skull Coast Brewing Company, Inc. was incorporated in North Carolina in 2011. Finding a home in Hickory, North Carolina, the brewery began work on bringing in a 30bbl brewing system as well as an automated canning system, with a 1,500 square foot taproom. The brewery was to be located in the Hollar Hosiery Mill project, with Skull Coast signing a lease in April of 2012. However, things did not go according to plan. You can read the entire history (which is well documented in the brewery’s blog) about what happened instead. That’s available here: http://skullcoastbrewing.com/captains-blog/ To make a long story short, there were some development setbacks, some disputes, and later, discovery of liens against the Hosiery Mill. Seeing these issues, that appears to be when Skull Coast decided to (for lack of a better term) abandon ship. Skull Coast went radio silent at the end of September 2013. 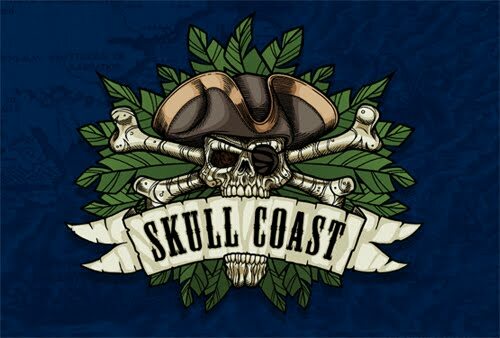 Skull Coast is pleased to announce that it has a new owner and president! One of her first actions has been to look at three potential brewery sites for her planned 15-bbl brewing system: Rock Hill, SC, Wilmington, NC, and Savannah, GA. Stay tuned for more announcements in the coming days! The company was then flooded with responses, mainly from those in the Rock Hill area wanting the company to return home. The company was quick to caution though that Rock Hill had not been as aggressive in pursuing the brewery as had Wilmington and Savannah. The company went on to say that as to Rock Hill, a general contractor was putting together a quote to fit the space the brewery was interested in, which is a space right off of I-77. However, it again cautioned that Wilmington and Savannah were being more aggressive on the economic development side in attracting the brewery with financial incentives. Whether Rock Hill can meet or beat those is still unknown. The brewery did assure, though, that even if it went to Savannah or Wilmington that it has maintained its distributors in both South Carolina and North Carolina, so product would be available in both places. So, now, that begs many questions. What will Skull Coast do? Will it come back home to South Carolina after leaving? Will it stay in North Carolina? Will it set sail to a new state? How are breweries to balance the needs of being a for-profit business with other considerations, such as communities in which they are located (or were located)? Does it even need to? For some, these are difficult questions. There are many factors to consider for the company, such as communities, economic incentives, and favorable laws. What will win out? What are your thoughts? These days, I’m trying to limit this blog to legal issues impacting South Carolina (and regional) breweries. However, this was an issue that does evoke strong feelings in some people. I found it to be worth writing about. Certainly, laws in South Carolina, North Carolina, and Georgia will be considered in the company’s decision. I’d like to speak on those in a future blog. Is there anything to update on this since January? We are a big fan of the porter and watermelon wheat and would love to have them back in Myrtle Beach again. It seems like with them gone this long, they have decided to permanently abandon ship. My understanding is that they are out of the beer business and have moved into spirits. Specifically, rum.